The computation of volumetric mammographie density in a breast is based on both image data and knowledge of the thickness at each pixel. 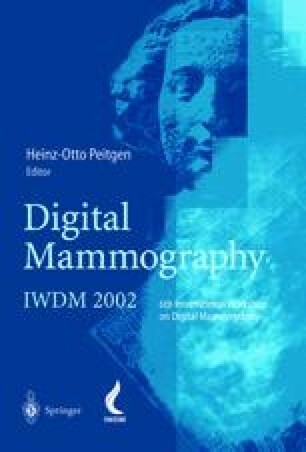 Our goal is to compute a thickness map at the periphery of the breast in order to improve the accuracy of measurement of volumetric breast density. Two methods are considered. Using a breast phantom to simulate the thickness changes in an image, we have modelled the radiation profile through the edge of the breast, based on a phantom whose shape approximates a semi-circle. In a second method, direct thickness calibration is performed using a tissue- equivalent triangular attenuator. The phantom thickness map in the peripheral region is then mapped to that of the breast image using a thin-plate spline interpolation algorithm.